Such a big thrill for me! Click on the image to go right to Amazon! This was a big week for me. For the first time in my life, I can say I’m an author. I’ve written a book. I’ve endured the anxieties that come along with self-publishing, and miraculously, I’m still standing. It’s been a week where sleep has meant very little, but my friends have meant a lot. But what was overwhelming this week for me was not launching it. That part was pretty easy. The overwhelming part was how responsive my friends, colleagues, and family members have been with regard to the book. Friends have reached out and said, “We can’t wait to read it!” They’ve posted my announcements on their Facebook pages and pinned to my book on Pinterest. They’ve talked about it and passed along the word to others. I’ve been on a high all week. I’m so thankful. I truly am. And guess what that does? It makes me want to work harder the next time I put something out there because I’d never want to let them down. I couldn’t have gotten to this point without my support system. My Facebook friends have been amazing. I’ll be forever grateful. On Amazon's list of 4-for-3 yesterday. The most fun has been watching the book move around on Amazon’s “Hot New Releases” area under the 4-for-3 category. 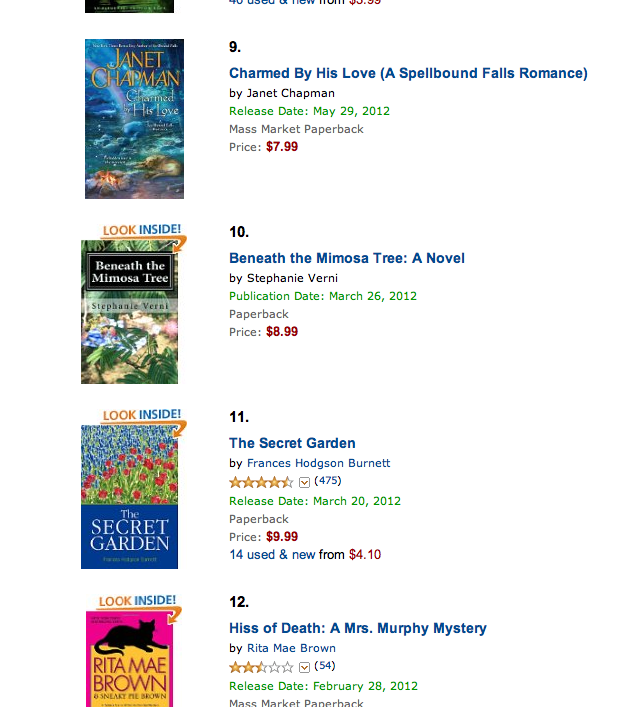 At one point, I hit #10 under “general fiction.” When I saw Nicholas Sparks was at #1, it was the biggest thrill. In that category, I was only nine behind him. Previous Post PUBLISHED! “Beneath the Mimosa Tree” is FINALLY for Sale. Congratulations on the success of your new book. I know you have put your blood and sweat into your work and the end result shows that. Good luck with future projects and I plan to get your book for Fran for Easter. Keep going!